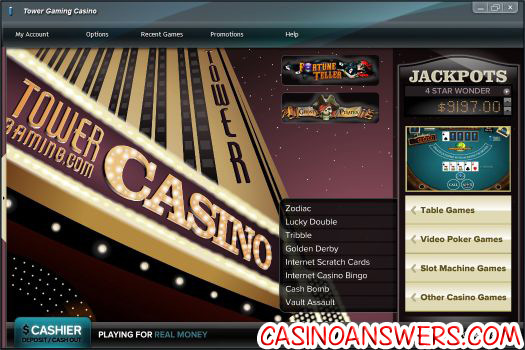 Tower Gaming Casino Review - Casino Answers! The support Tower Gaming offer is excellent. First of all, they offer a huge knowledgebase that will answer the majority of questions or issues that you have. 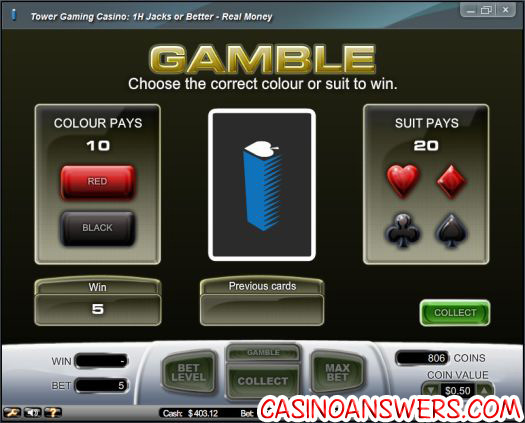 Not sure how to deposit to the casino? Need help cashing out? Problems installing the software? Not sure how to deposit with an e-wallet? 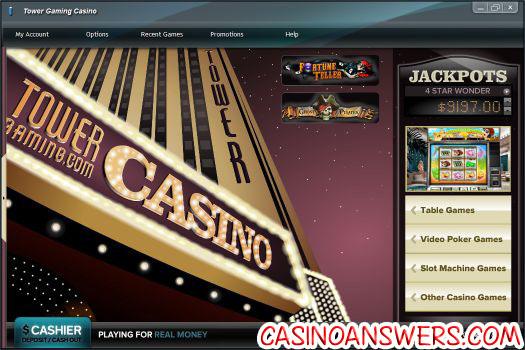 Whatever your question is, the Tower Casino support knowledgebase should hopefully have the answer for you. If they don’t have the answer, then you can contact support via e-mail or live chat. Both support options are extremely responsive, and were helpful when we approached them with issues that we were having. All players have the ability to become VIP players at Tower Casino. When this happens, you get your very own VIP manager and support, who will be there to assist you with any problems, and will also offer you a variety of exclusive promotions. As if that wasn’t enough, Tower Gaming also offers a casino school, so you can learn about their games before playing. At a time where good casino signup bonuses are hard to come by, Tower Casino offer a fantastic deposit bonus for all new players. 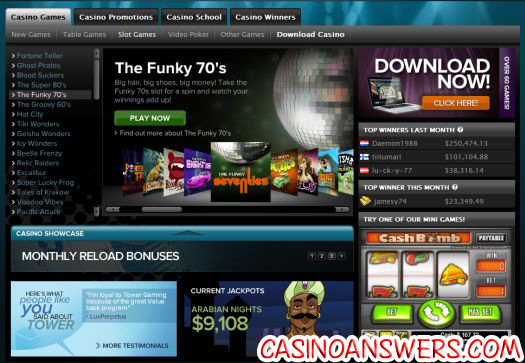 This bonus is a 100% to $100 casino signup bonus, which is added automatically to your account. The wagering requirement for the initial deposit bonus is 20x, and in this day and age is great for bonus whores. While the deposit bonus may seem on the low amount, Tower Casino also offers a variety of high roller bonuses for the VIP players, so if you like to play for big stakes then don’t worry – you will get rewarded with some great casino bonuses. 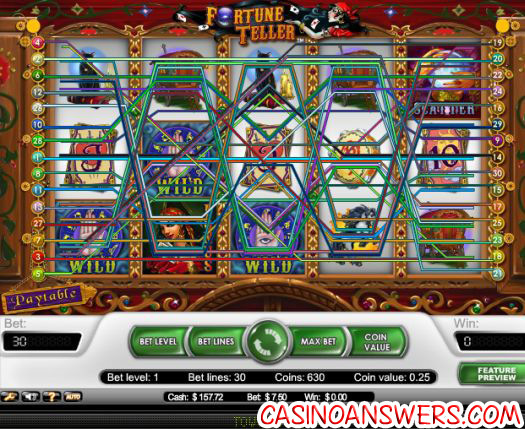 Tower Casino uses Net Entertainment software, and is one of the only online casinos to offer such excellent operating system compatability. They offer a downloadable client for both Windows users and Macintosh users. So whether you’re on your Windows XP machine or your Apple MacBook Pro, you’ll be able to download Tower Casino and play from the comfort of your own desktop. 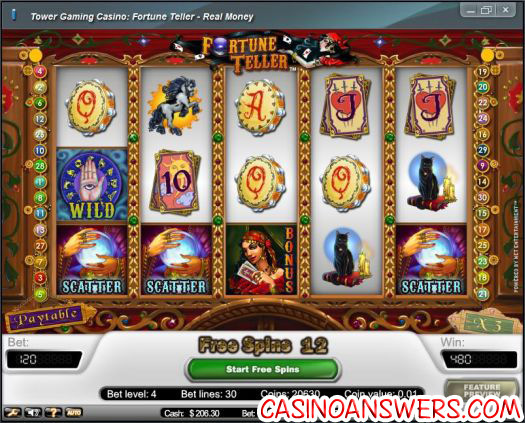 Tower Casino also offers online casino games in their browser based flash environment – some of the games may also utilize Java. 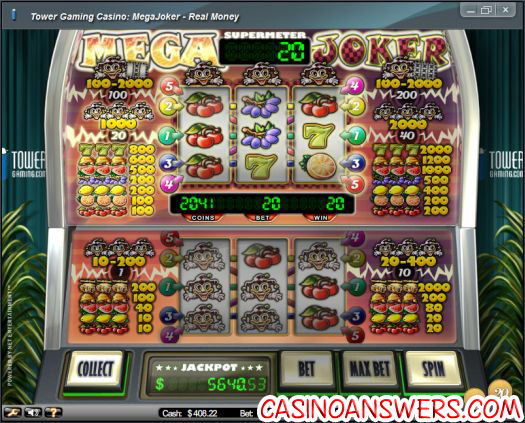 This means that the software is compatible for all casino users, even Linux. Their software is very easy to navigate, and their browser based software especially is very slick and visually appealing. 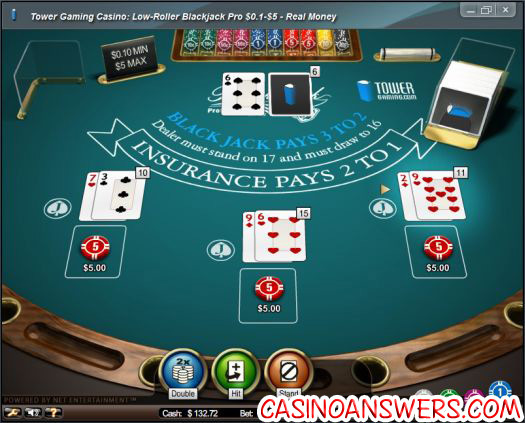 The weakest point of Tower Casino is without a doubt their game selection – however this is more an issue with other casinos offering a better game selection, than Tower Casino having a bad game selection. Tower Casino has a great selection of games, including over 12 Progressive Jackpot casino games. 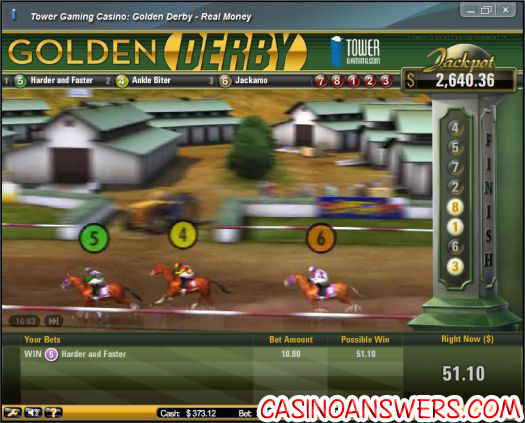 Tower offer both 5 Reel and 3 Reel Slots, and a bunch of unique arcade games and scratch cards – the Golden Derby arcade game is without a doubt our favourite casino game. Tower Casino also offers all the basic Video Poker and Table games, although that’s where they could add a good bit of variety, as they currently only have 3 video poker games – although all 3 offer the ability to play up to 25 hands at once. Still, with all the basic table games like Blackjack, Roulette, Let It Ride and Caribbean Stud, all available from low stakes to high stakes, Towers game selection is still very solid. 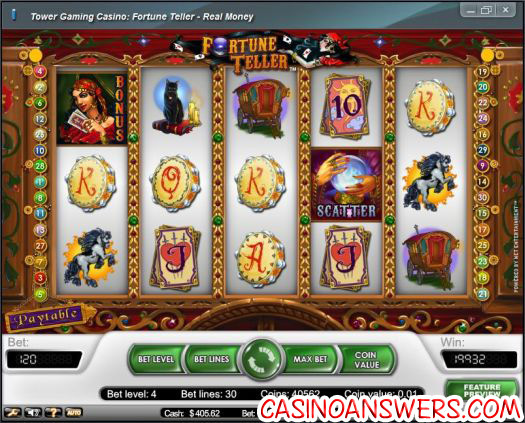 Tower Casino offer a variety of promotions for the player, and are always running specials. The player accounts we have at Tower Gaming get e-mails every few days with yet another unique and awesome promotion. Tower don’t just concentrate on promotions for their casino either – if you’re interested in online poker and sports betting they always have some amazing promotions for those too. Their comp points system they use for their casino is rather basic, in that all you can do with the comp points you earn is trade them for cash, however their rates are great, and once you become a VIP you open up a world of new and unique rewards. I am a Mac user, so the first few online casinos I played at, I could never download the software and often was limited to what games I could play. Not anymore now that I’ve signed up at Tower Casino! I can download their software or play in my web browser. Naturally, I have downloaded their software (which is excellent BTW). The one problem I have with Tower Casino is it doesn’t have the most number of games. The ones they do have are good though. 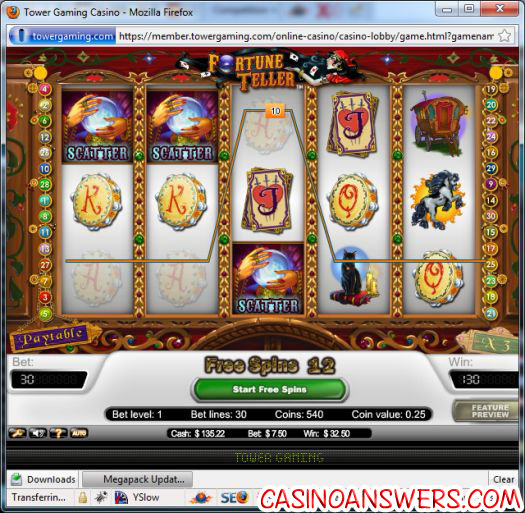 Tower Gaming Casino is without a doubt the best online casino which uses Net Entertainment Software. The only real negative with Net Entertainment casinos is they don’t accept Americans or Canadians. 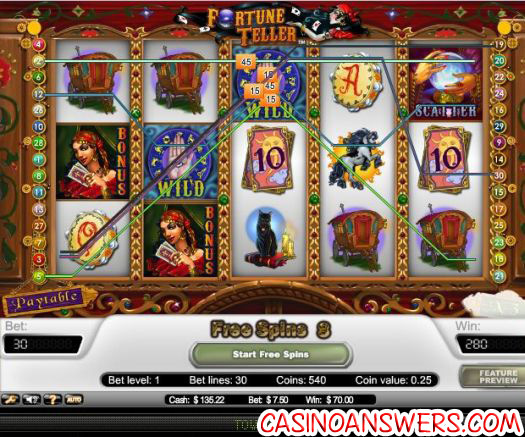 Tower Casino offers a great 100% to $100 deposit bonus with a small playthrough requirement, an excellent rewards program, and both Windows and Macintosh Compatible Casino Software, along with a browser based flash casino. Tower Casino also offers Sports Betting and Online Poker with the same account, and it is very easy to move your money around. Tower Casino is one of our personal favourites, and offers a detailed knowledgebase which offers their own casino strategy. What happened to the freeroll tournaments at Tower Casino? Every Saturday, Tower Casino used to run slots freeroll tournaments, where you could earn money for free. Unfortunately at this time they have disbanded the freeroll tournaments and all other casino tournaments. 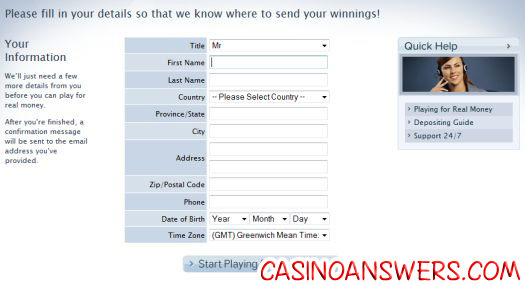 They have stated that when they run casino tournaments they will send out an e-mail to all registered users with information about them. How do I get the Tower Gaming Casino bonus? To get the initial deposit or signup bonus, simply make a deposit. The bonus is then added to your account automatically and within seconds. Does Tower Casino have a refer a friend program? At this time Tower Casino does not offer a refer a friend bonus. 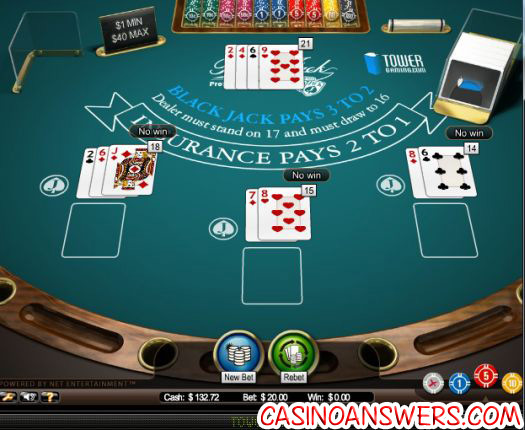 What Nationalities can play at Tower Gaming Casino? The following nationalities can play at Tower Casino, but can not claim the signup/deposit bonus: Denmark. 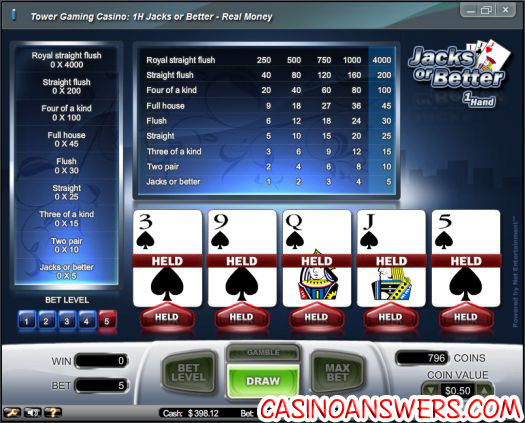 Please return to our Online Casino Reviews section if the country you are from is listed above. 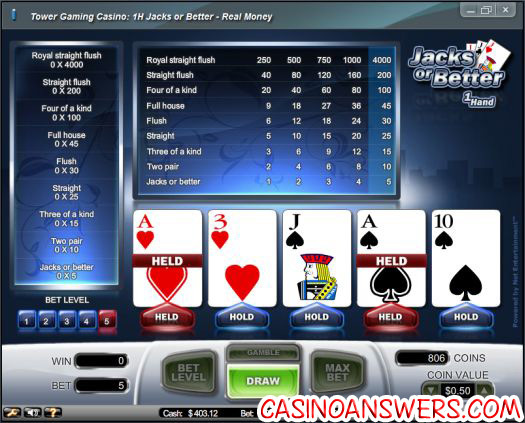 If you are not sure where to play, you can also send us an e-mail at site@casinoanswers.com with your details and we will help you pick out the best online casino for you. Tower Gaming Casino gives players a decent selection of games to play. We have written up brief overviews of some of their games, some of which we have full slot reviews available for. 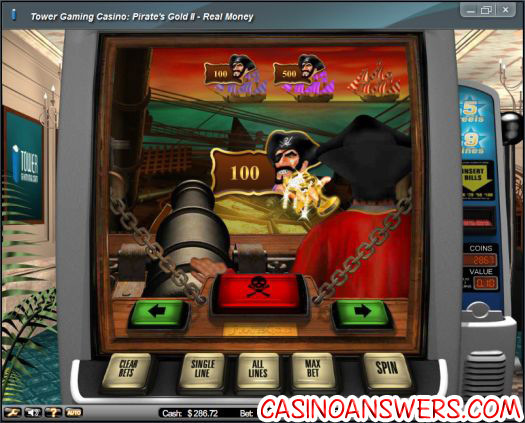 Dead Or Alive Video Slot: Dead or Alive is a 5-reel, 9-line Net Ent video slot found at Tower Gaming Casino. It has a wild west theme to it. The main feature is a free spins feature where you can win 12 free spins at a 2X multiplier (meaning all of your winnings during the free spins feature will be doubled). The top jackpot win on the Dead or Alive slot game is 1500 coins, but you can also get a scatter win of up to 2500X your total bet. 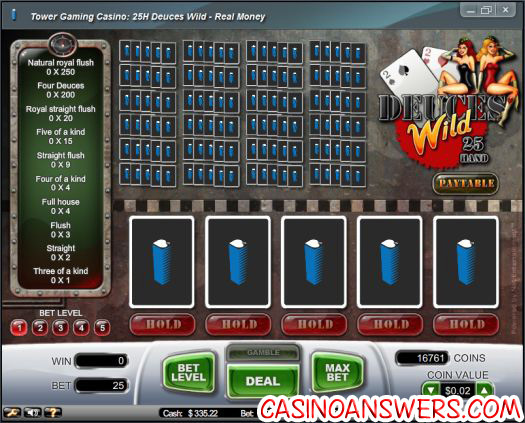 For more information, please read our Dead Or Alive Video Slot Review. 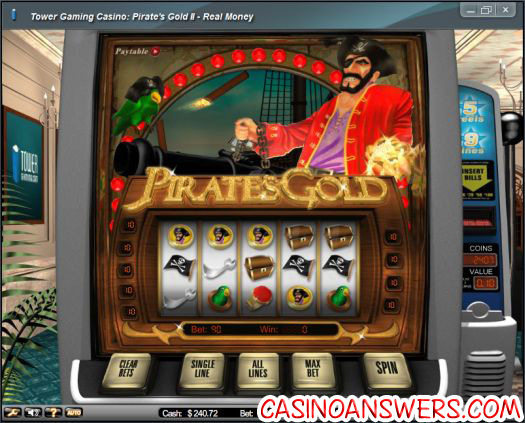 Gold Rush Classic Slot: The Net Ent Gold Rush slot game is a classic slot machine made up of three reels and one single payline. All bets on the Gold Rush online slot are $0.20, with the ability to play 1-3 coins (so $0.60 max per spin). Gold Rush features a progressive jackpot which can be won by playing the maximum bet and hitting 3 Gold symbols on the payline. 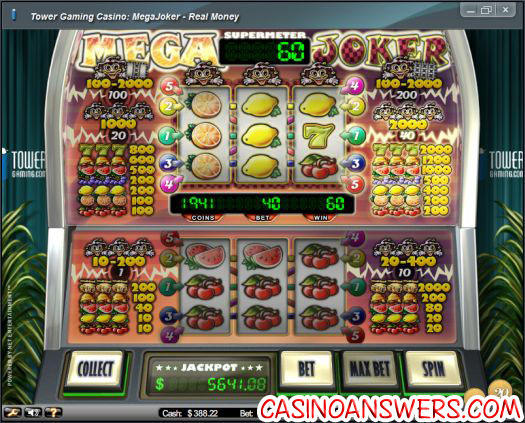 The top fixed jackpot is 3000 coins, which you can win by hitting 3 Gold symbols anywhere on the reels. 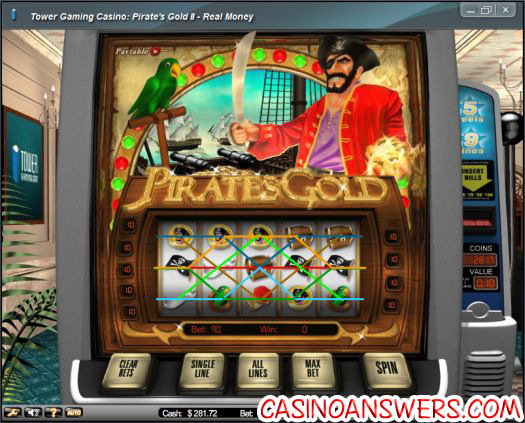 For more information, you can read our Gold Rush Classic Slot Review. Bonus Keno: Bonus Keno is the lone online keno game offered at Tower Gaming Casino. You’ll get a free round of keno if you can hit 5 Bonus Joker symbols in a game of Bonus Keno. Bonus Keno also has a progressive jackpot, which can be won if you form a “J” pattern on the keno board. 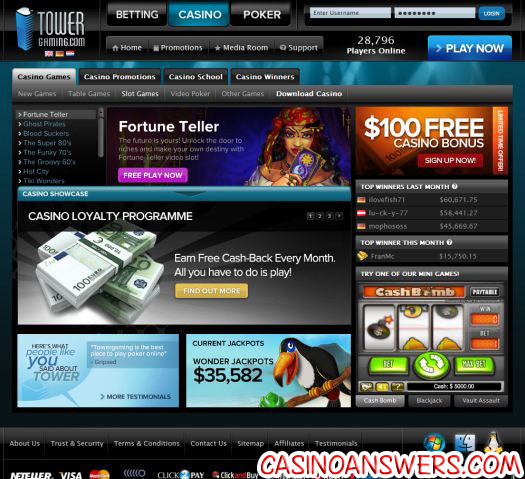 Tower Casino is only available in the currency of US Dollar. This is due to network restrictions. In the past, Tower Gaming Casino has offered a variety of tournaments. These included freeroll tournaments like the Radical Reels Slots Freeroll tournament, as well as Video Poker tournaments. All these tournaments were held on a weekly basis. Unfortunately at this time, Tower Casino is not offering any casino tournaments. We will update this as soon as they are. The initial deposit bonus from Tower Casino is a 100% to $100 deposit bonus. You deposit one hundred dollars, and you will receive a 100 dollar match bonus immediately in your account, giving you $200 to spend. You will then have 30 days to clear the bonus, which means clearing the wagering requirements. This is a 20x bonus, so you have to wager exactly $2,000 at which point you can withdraw all your casino winnings. After the 30 days have expires, the casino bonus is removed from your account. 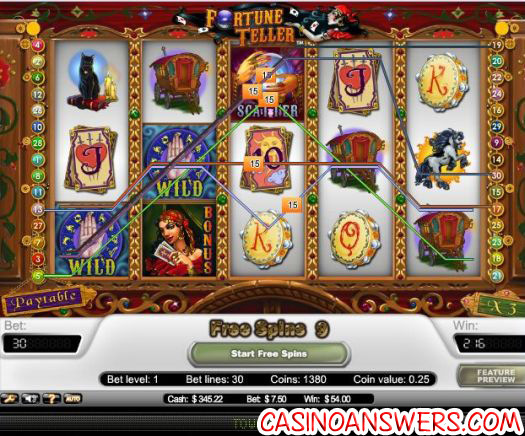 Tower Casino also offers frequent reload bonuses. Along with special VIP Casino bonuses, Tower Casino also offers monthly 50% to $50 bonuses for all players with small wagering requirements too. Welcome to my next installment of my Casino Blog. This week we will be playing at Tower Gaming Casino. 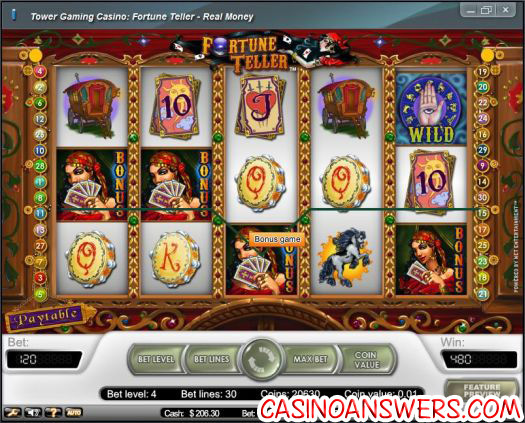 Tower Gaming Casino uses the Net Entertainment Software, and offers a 100% to $100 signup bonus. 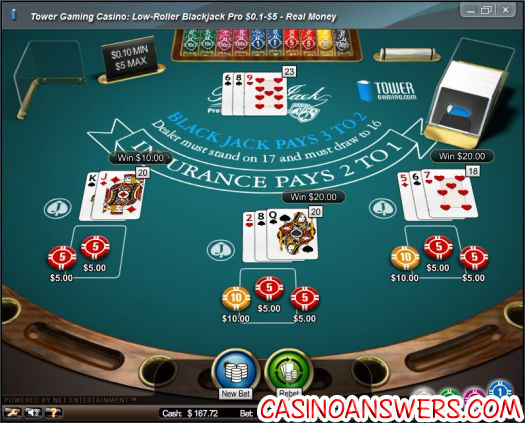 Tower Gaming Casino is a very professional looking website, that also offers online poker and sports betting. Let’s get signed up and get that bonus!Play at this years #1 online casino for United States - Slots.LV. One big feature of Tower Gaming Casino I notice right off that bat, is that along with a PC client they have a Mac OSX client too. Most online casinos don’t have specific clients for online users – just browser based versions – so that’s a nice bonus for you Mac guys. As you can see – a very slick design. 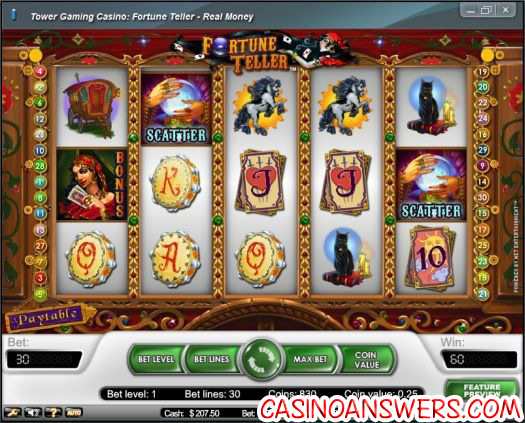 One thing to note about Tower Gaming Casino is that they use the Net Entertainment Software, and at this time are the only online casino that has a downloadable client for Net Entertainment. 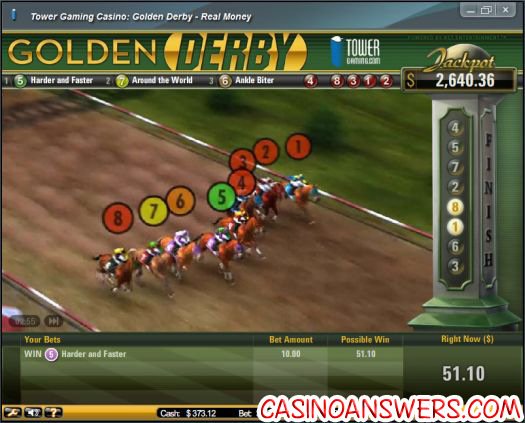 We will be trying out both the download software and the browser based casino software. Upon installing and running the Tower Gaming Casino software, I get prompted to log in or create an account. Creating an account was a nice simple one step process, then you just have to get an e-mail sent to you and boom, you activate your account. 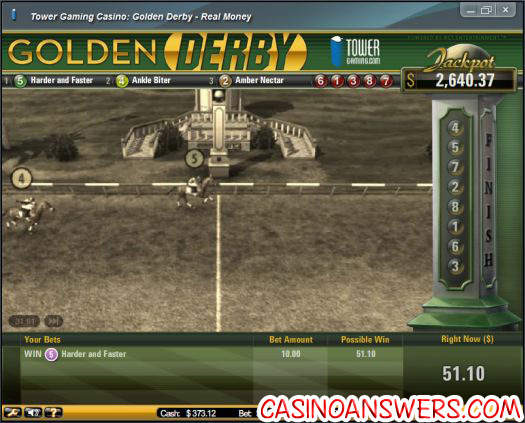 The signup process goes very smooth, and Tower Gaming Casino have a wide variety of deposit options. I deposit my $100, and my $100 bonus is instantly put into my account, nice and smooth. 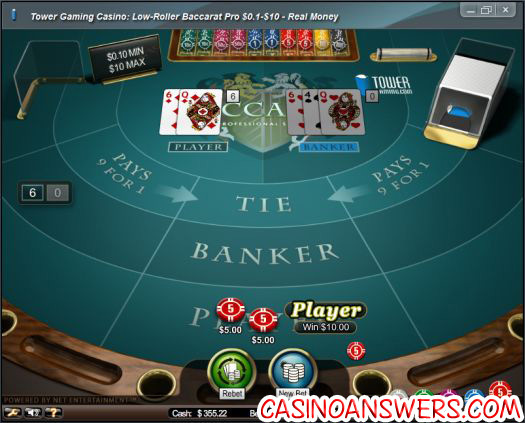 Welcome to the first day of my Tower Gaming Casino blog. As I mentioned, I’m really looking forward to playing at Tower Gaming Casino. They use the Net Entertainment Software which I’ve never used before – so it will be good to have a fresh look and appeal at it. Right now we will be using the downloadable client. Lets get started at Tower Gaming Casino.Play at this years #1 online casino for United States - Slots.LV. And as you can see, I already got off to a good start on my first spin. I was just playing around, and clicked the spin button and I won $15.00 off a $7.50 bet. Not bad. As you can see the layout on it is absolutely beautiful, very slick slot. I decide to bet the maximum – that’s bet level 4 as in 4 credits, bet lines 30 as in 30 lines. So that’s 120 credits total – with only $200, it’s best not to risk too much so I will do the minimum bet of $0.01. So at 120 credits, thats $1.20 a spin. This is the best slots strategy BTW – always bet the max when possible. That’s where the best payments are. Off ONE SPIN I just won 19,932 credits! I’ve doubled the starting bankroll to $405.62 right off the bat. An absolutely amazing start in this Tower Casino blog. Sweet! Wow. Biggest casino win yet credit wise. 19,932. Oh if only I had bet more. Come try YOUR luck at Tower Casino. Click here. Alright, after that amazing win I am not pushing my luck at the Fortune Teller slot for now. We’ll try out Video Poker. 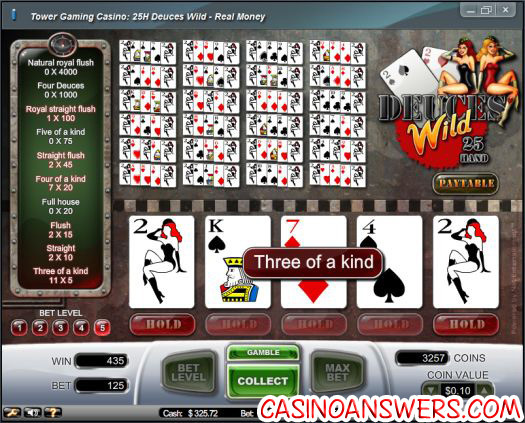 Tower Casino offers Joker Wild, Deuces Wild and Jacks or Better Video Poker. You then have the option of 1 hand, 5 hand, 10 hand and 25 hands. After that crazy win I am not ready for any more craziness – so we’ll do some simple 1 hand Jacks or Better Video Poker. Very slick. We’ll of course bet 5, the maximum bet available, and do $0.50 per game, so that’s $2.50 a bet at Jacks or Better Video Poker. You get to bet on what colour OR what suit you think will come up. Alas I bet on red and the :5c: came up but that’s still really sweet. Want to try it for yourself? Play for free at Tower Casino. I am LIKING Tower Gaming Casino! Alas the luck ends and I leave the video poker game with $383.12. I’m going to stop for the day in a second, because after that huge win on slots I feel untouchable – and that’s always a bad thing when it comes to online casinos. This thing is really cool. You can bet on 9 horses, and it lists their win odds. You can bet on them winning, placing and showing, betting exacta and quinella, multiple bets – the whole works. I will take the horse entitled Harder and Faster – the way I like my women – at 5.11 to 1, to win. And as you can see – I am the winner! We’ll stop this blog at $424.22. Back tomorrow. I am LOVING the Net Entertainment Software. Thank you Tower Casino! 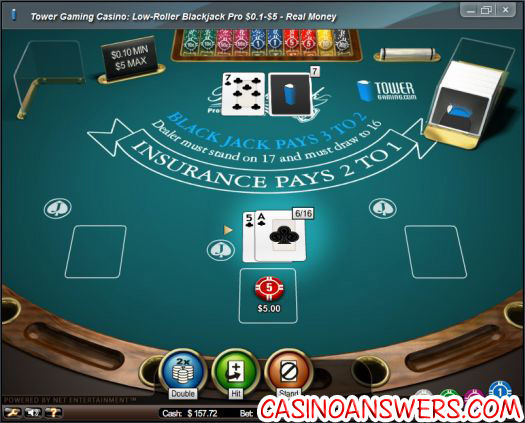 Welcome to day 2 of the Tower Gaming Casino Blog. We had an excellent start to the casino blog in day one, as we more then doubled our initial balance of $100, ending the day with $424.22. Let’s head into Day 2 of our journey at Tower Gaming Casino…Play at this years #1 online casino for United States - Slots.LV. 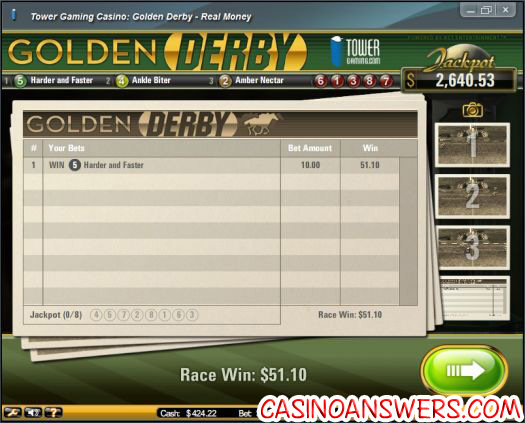 First of all, to check the wagering requirements we just have to log into the website and it is updated in real time. It’s right under my account, and lets you know the bonus you have activated and the amount left to wager. I’ve got $5981.30 left of a $6000 wagering requirement. One thing I also like is Tower Gaming runs a variety of freeroll casino tournaments. They have the Radical Reels slot tournament, the Wild Card Video Poker Tournament and even the Casino Hold Em tournament. You can sign up for free to play these tournaments by clicking here. This slot is really cool. 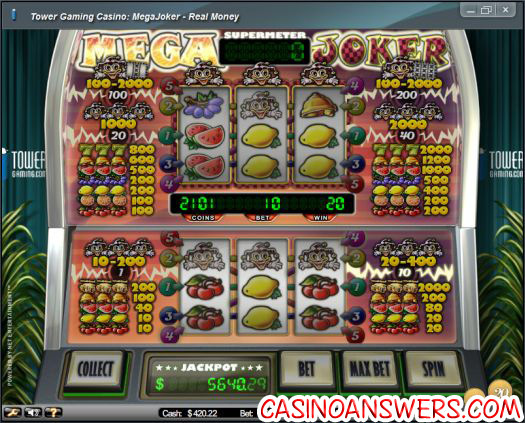 It features a variety of different modes including basic mode, supermeter mode and of course has a progressive jackpot. Alas we don’t win anything in supermeter mode. FYi supermeter mode is unlocked after you win on a spin, and it’s the top area which is where you can win the big money. Really cool concept – don’t think I have ever played a slot like that before – it’s a really nice bonus game. Unfortunately we don’t pick up any more wins, so with $350.22 left we’ll try somewhere else. I decide to try out Baccarat Pro – I’ve never actually played Baccarat before, but with the aid of this Baccarat Rules website, I’m willing to give it a try! Great start, and what I really like about the software is (1) it allows you to rebet with ease, and (2) it keeps track of the previous hands played, and the exact scores. I should also mention they have three different versions of Baccarat. You can play low roller, medium roller or high roller. The high stakes Baccarat game is where you can bet a minimum of $10, and a maximum of $1000. Yikes, that’s a hell of a lot. I’ll be honest – not a big fan of Baccarat. I play it for a bit but it doesn’t really hook me – I much prefer games like Blackjack or Video Poker where I actually feel like I am in control of my destiny. 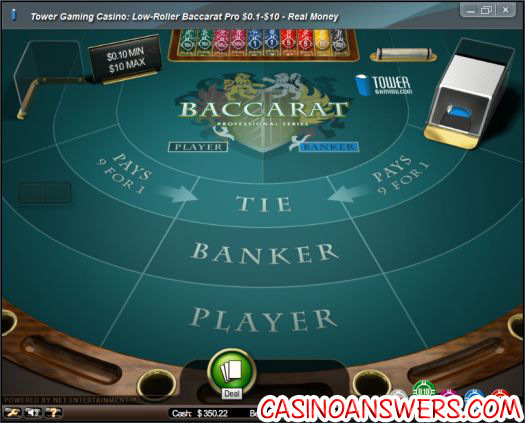 However if you are a Baccarat player the software is really slick and fast – click here to check it out. The great thing is – they have very low minimum stakes – $0.02 coin value – so even though you are playing 25 hands, you can be playing as low as $0.50 per hand! Actually I just checked and you can even set a coin value of one cent – that’s sick, meaning you can play $0.25 per round of 25 hands of Video Poker. Very impressive, and great that they accommodate the penny video poker players like that. 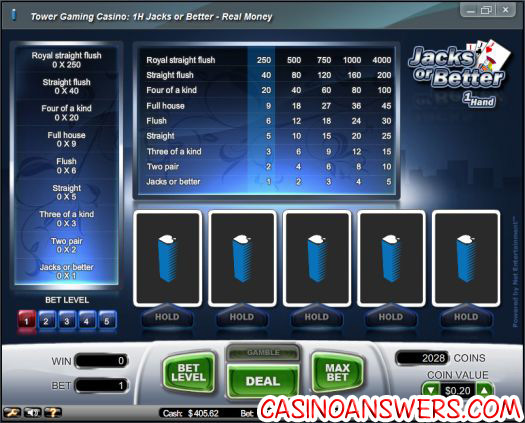 You also have a bet level of up to 5 – and that’s where you want to be betting obviously, because then you can get the best odds, and it decreases the house edge. I never know what is optimal in these situations. Do I hold onto the :7c:, :5c: and :8c: aiming for a straight flush? With a payout of 45 that doesn’t seem right. I choose to draw, and pick up some three of a kinds, four of a kinds and a full house. I win 50, alas I bet 125 so that was a loser. Then a few hands later I pick up a natural flush, which gets me 25×15 payout for 375 credits. Well that was a lot of fun, and a good way to go out. I’ll be back later in the week with the 3rd blog. Don’t forget those freeroll casino tournaments – click here to play at Tower Casino. 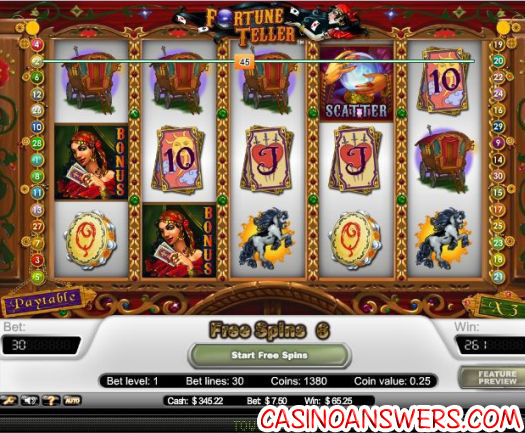 I have a confession to make – last night I decided to log onto Tower Casino just to play one of their free slots tournaments. Well I played(and lost) but I ended up getting hooked on some of their slot machines – and unfortunately didn’t do so well. My last blog ended with a balance of $350.15, however we’re starting this blog with $273.72. 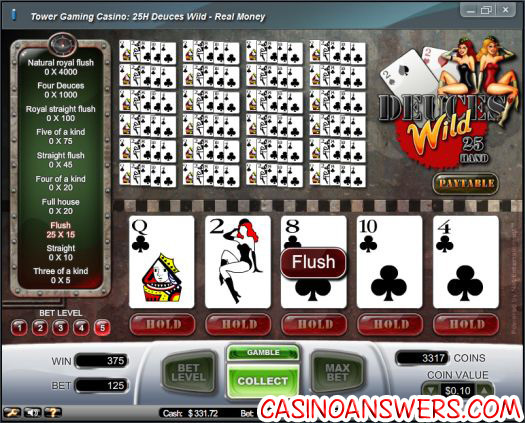 Oops.Play at this years #1 online casino for United States - Slots.LV. 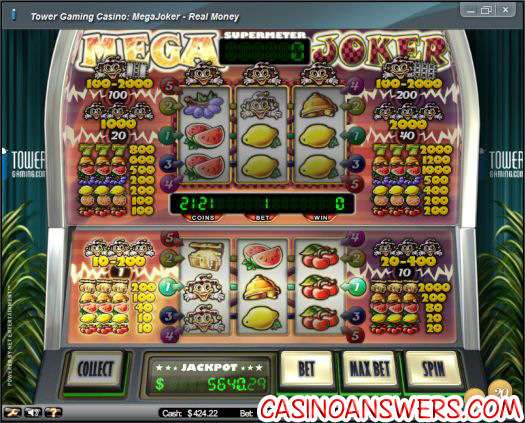 As I’ve mentioned before – this is the first time I’ve played any online casino that utilizes the Net Entertainment software – and it certainly won’t be the last. Some of the slot machines they have are phenomenal and I find myself getting easily hooked on them. If you want to play them for yourself I highly recommend the Fortune Teller slot machine. Check it out at Tower Casino. 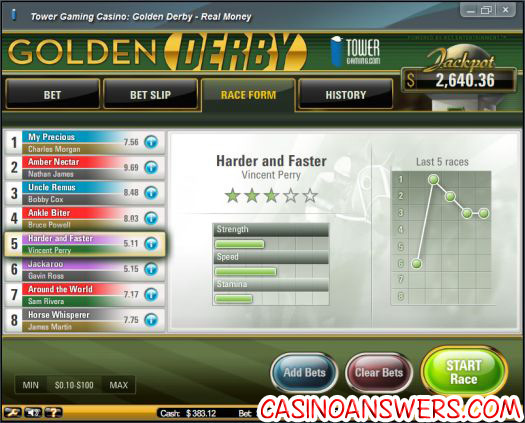 Now in day one of my blog I played the awesome game Golden Derby. Basically this is a horse racing game, where you bet on a horse then watch the race play out. The description and pictures I provided really didn’t do it justice, so I wanted to record a Youtube video showing it. Great race, and a fun game to play. I could seriously blow all my money on that. 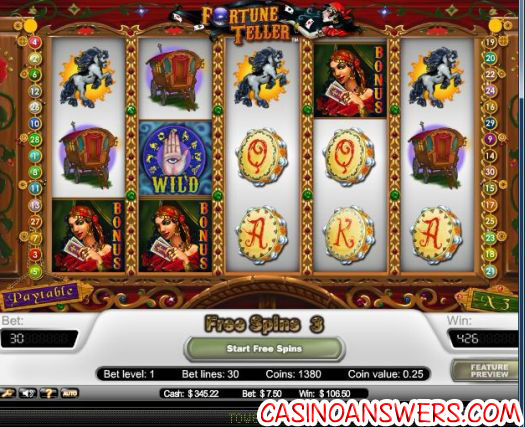 If you want to try it out for free, visit Tower Casino. 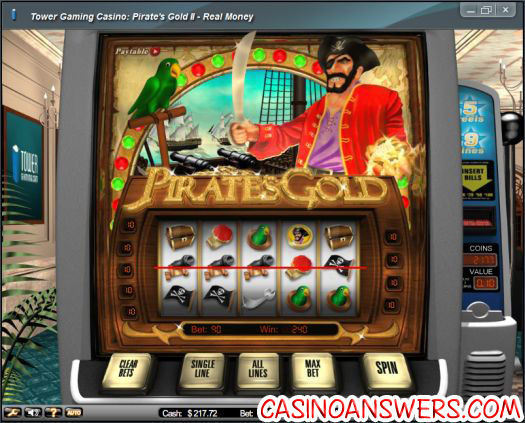 We’re going to try out the Pirates Gold slot machine today. This is a pretty crazy slot machine where you can bet up to 9 lines – but more importantly you can bet a maximum of 10 credits on each line, which is really crazy. 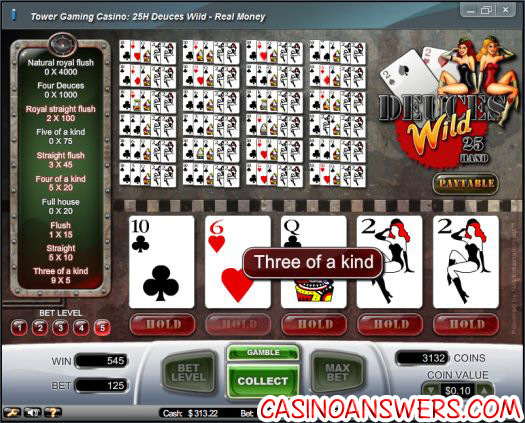 A really good high roller slot machine, or one for the action junkies. As you can see, a really nice, attractive looking slot machine. There is also two bonus games available. 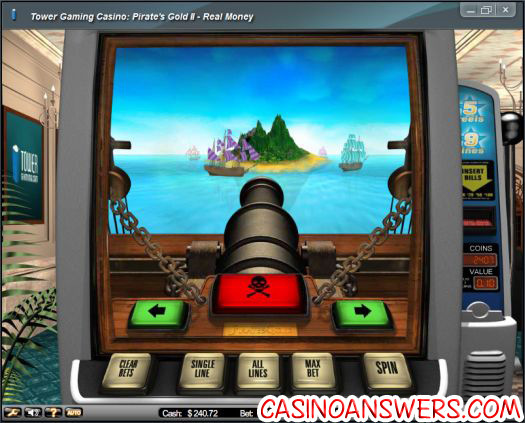 The first bonus game is unlocked when you get three or more pirate coins on a betline. You apparently use a cannon to shoot and sink an enemy ship which sounds fun as hell. The other bonus game you have to use a parrot that will use a golden key to open a treasure chest. 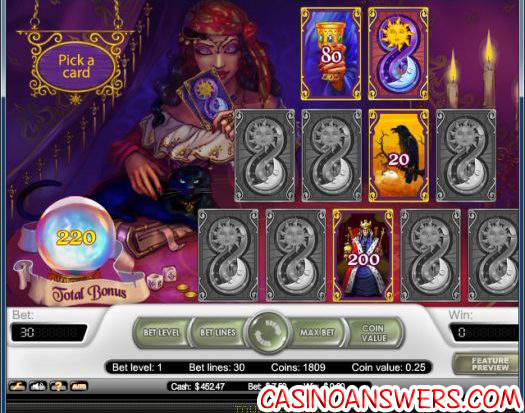 The treasure chest contain 100, 200, 500 or 1000 times your bet. We get another bonus game on the very next spin, which sees a win of 200 credits. Geez – so many bonus games. Maybe this slot machine is broken! Unfortunately we don’t get the same sort of luck as we did at the beginning, and at $162.72 I reluctantly close the slot machine to play something else. That was fun as hell though. 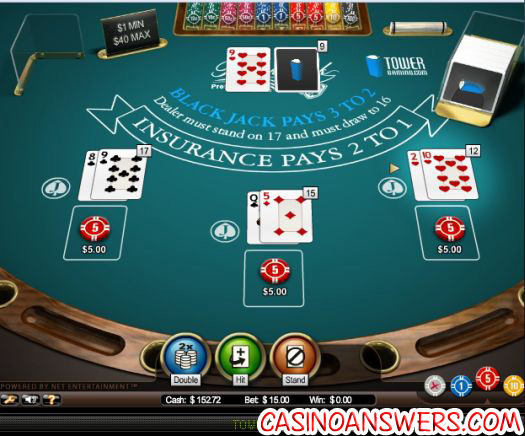 We’ll finish off this blog with some good old fashioned Blackjack. Hopefully you know the Blackjack rules by now. 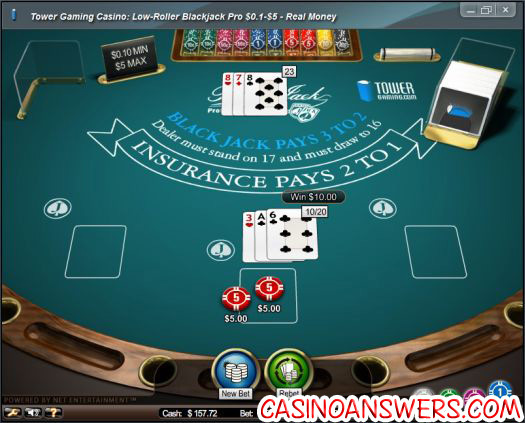 Tower Casino offers Blackjack Professional or Blackjack Pro – which allowed the Double Jack sidebet. 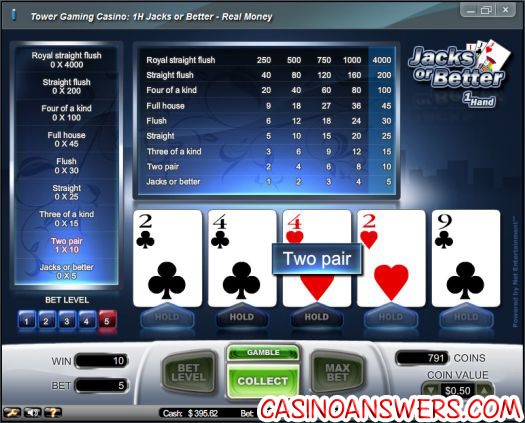 Basically you can place a side bet and get some sick payouts – for example if the first card is a jack then you get 10x the bet, a pair of jacks are 25x bet, and if you get two :js: then you get 100x. Sweet deal. Really nice appealing software as you can see. Unfortunately I hit on that hand, and pick up a 6 followed by a queen to go bust with 22. Oops. As I double up on two hands and win all three, for winnings of $50. Hell yeah. I’ll be back on Monday with day 4 of the casino blog, as we check out Towers browser based software and compare it to the downloadable software. 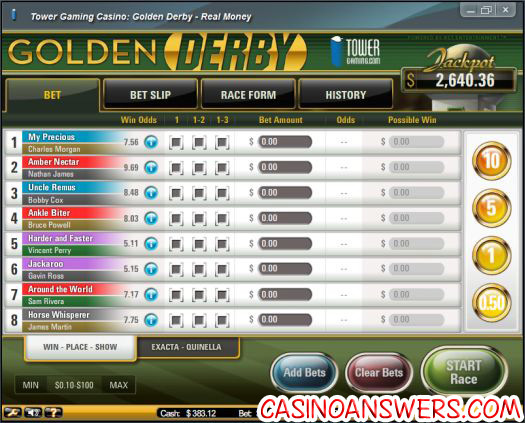 And most likely play more of that freakin Golden Derby Horse Racing game. Addictive as hell. Alright, I took a little bit of a mini-sabbatical there to focus on my casino site Casino Answers, but I’m happy to say that we are now back, and ready to roll. Got a few reviews to put up, a few things to fix around the website, but first and foremost: let’s go back to Tower Casino, and finish off our Tower Casino Blog.Play at this years #1 online casino for United States - Slots.LV. So, the last time we played was day 3. Our balance is currently $167.72. We’ve only been using the download software, however the guys from Tower read the blog, and wanted to let me know that if I like the download software(which I do) then I’ll absolutely LOVE the browser-based flash software. Sounds good to me, lets try it out. Now on any other website with browser based software, I’ve found the browser software to be secondary, and download software to be primary. However it seems to be the other way round when it comes to Tower. The lobby and design is really slick, and it’s actually integrated into the website. Every other casino generally loads up their own flash platform in a new window. This is really cool, and you choose a game to play, then boom, you’re playing it. First things first, we’ll hit up their multi-hand blackjack game. 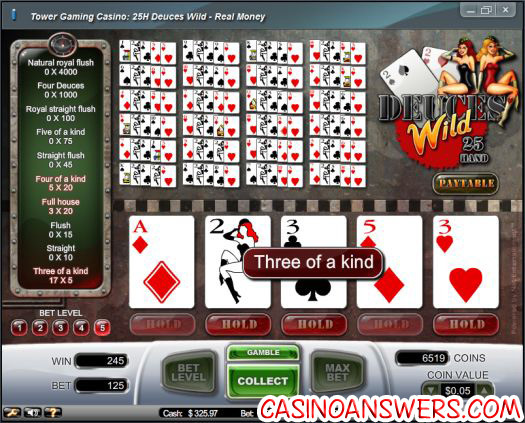 This is a game where you can play up to three Blackjack hands at once. 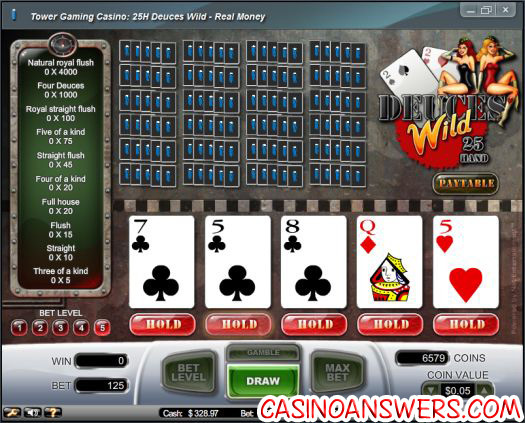 If you want to try it out for yourself, here’s a Multi-Hand Blackjack Flash Game that you can play. Unfortunately we go bust on two hands, and the dealer turns over the :as: so we lost the 17 hand. Alright, that’s Multi-Hand Blackjack for you. 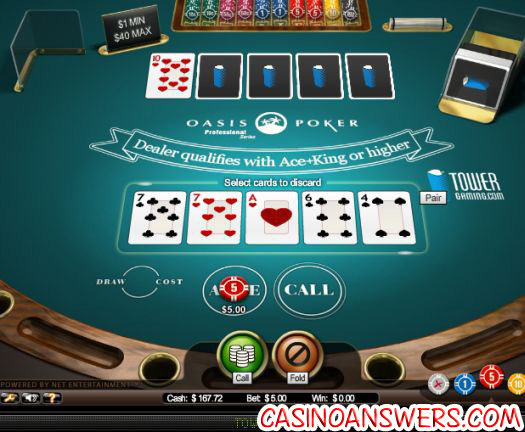 However Tower also has Oasis Poker Pro which is a fun game that I like to play. If you’re not sure of the rules, there is one 52 card deck, shuffled before each round. You have the option of discarding and drawing cards, and the best 5-card poker hand will be declared the winner. The dealer qualifies with Ace/King or Higher. 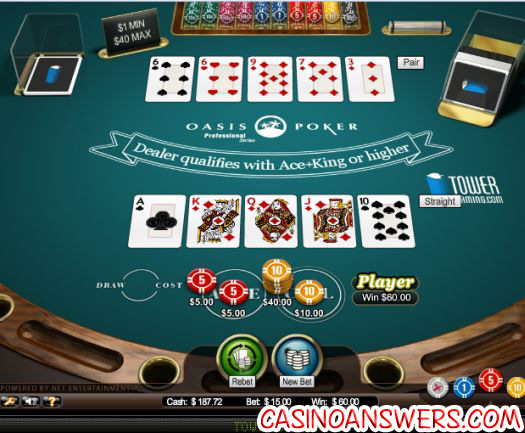 If you want to try it out, here’s an Oasis Poker Pro Flash Game for you to play. Now I have a pair of 7s. If I want to, I can discard any of my cards. I bet $5, so it will cost me $5 to discard. That’s how it works. I choose not to discard, and unfortunately the dealer turns over a 10 of diamonds to beat me on this one. Oh well. Fun game, and we go on a nice run turning our balance into $220 for a bit, however I leave the table at $167.72. I’m going to finish this blog at the Fortune Teller Slot Machine where I got so lucky the last time I played, and I won 19,000 credits…alas, that was $0.01 a credit, so I only won $200. Oh well. First spin is a loss. Second spin…also a loss. 30 freaking lines and I can’t win, I must be the most inadequate slots player in the world. As we get winnings of $32.50 PLUS 12 free spins. Oh baby. And the end result? We win 835 credits, which is winnings of $208.75 putting our balance at $343.97. Oh baby. 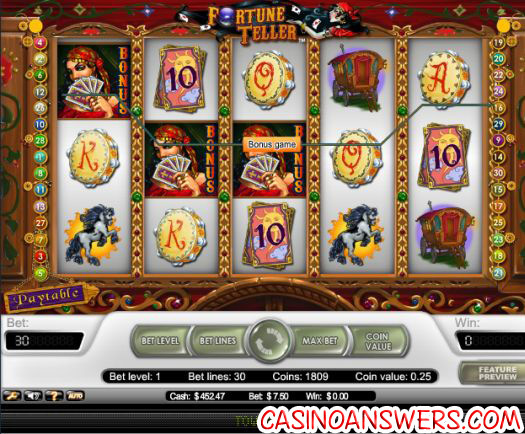 The Fortune Teller slot is still lucky and paying out – try it today at Tower Casino. Which puts our balance at $527.47. Looks like this is going to be one of those 10 day blogs, much like the Slots Oasis Casino Blog. 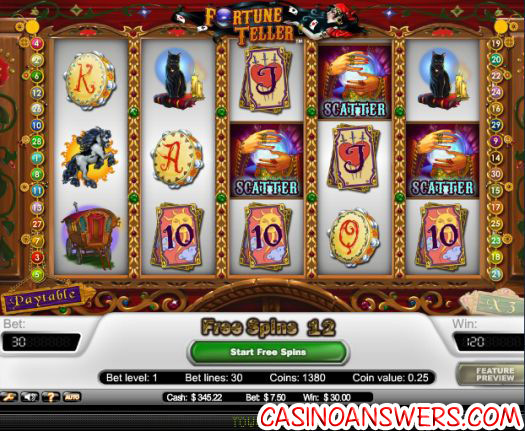 I’ll be back tomorrow, and in the meantime – go play the Fortune Teller Slot at Tower Casino.